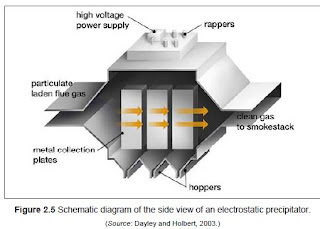 This site had previously analyzed the deaths per terawatt hour by energy source. Air pollution from fossil fuel (coal plants and oil used in cars and trucks) and developing countries burning wood or coal inside their homes are one of the biggest causes of all kinds of death and illness. Worldwide, indoor smoke from solid fuel combustion causes about 21% of deaths from lower respiratory infections, 35% of deaths from chronic obstructive pulmonary disease and about 3% of deaths from lung cancer. Indoor air pollution from solid fuel use and urban outdoor air pollution are estimated to be responsible for 3.1 million premature deaths worldwide every year and 3.2% of the global burden of disease. In the year 2004, outdoor air pollution in urban areas was responsible for almost 1.2 million deaths (2% of all deaths) and 0.6% of the global burden of disease. Transportation-related air pollution, which is a significant contributor to total urban air pollution, increases the risks of cardiopulmonary-related deaths and non-allergic respiratory disease. Some evidence supports an association of transportation-related air pollution with increased risks of lung cancer, myocardial infarction, increased inflammatory response and adverse pregnancy outcomes (e.g. premature birth and low birth weight). Exposure to particulate matter, including metals, has been linked to a range of adverse health outcomes, including modest transient changes in the respiratory tract and impaired pulmonary function, increased risk of symptoms requiring emergency room or hospital treatment, and increased risk of death from cardiovascular and respiratory diseases or lung cancer. Particulate matter is estimated to cause about 8% of deaths from lung cancer, 5% of deaths from cardiopulmonary disease and about 3% of deaths from respiratory infections. * Investigate effective interventions and implementation methods for sustainable and financially viable changes to reduce indoor air pollution. * Encourage the substitution of solid fuels in the home by cleaner and more efficient fuels and technology. * Encourage the use of improved stoves to lower pollution levels in poor rural communities where access to alternative fuels is limited and biomass remains the most practical fuel. * Improve ventilation in homes, schools and the working environment. * Change user behaviour (e.g. drying wood before use). * Prevent and remediate problems related to dampness and mould in housing to decrease the risk of exposure to hazardous microbes. * Eliminate or reduce tobacco smoking indoors. Prohibit smoking in public buildings. * Promote risk reduction strategies for indoor radon exposure. There are also known safety measures to be taken with coal mining. (5000 deaths per year). Improved ventilation, prevention of gas and dust buildup. Shifting away from coal usage to safer energy sources. Standards for cars and trucks can be improved and there is retrofit and new technology for reducing particulates from current and future vehicles. Widespread adoption of Euro six air pollution standards on cars and trucks would save over 200,000 lives per year. 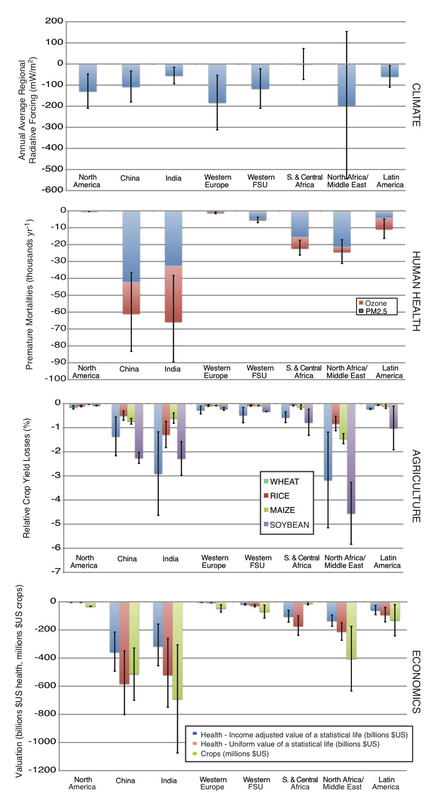 “The adoption of aggressive standards (euro 6) by 2015 would set the world on a course to prevent the deaths of 200,000 people, save 13 million tons of cereal grains from ozone damage, and save $1.5 trillion in health damages each year after 2030,” Shindell said. 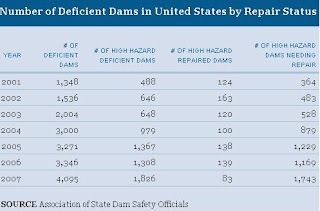 In 2009, the Association of State Dam Safety Officials (ASDSO) estimated that the total cost to repair the nation’s dams totaled $50 billion and the needed investment to repair high hazard potential dams totaled $16 billion. These estimates have increased significantly since ASDSO’s 2003 report, when the needed investment for all dams was $36 billion and the needed investment for high hazard potential dams was $10.1 billion. Similar studies and efforts are needed in other countries. There also should be better planning and preparation in the event of dam failures. Prevent people from building along the flood plain. There are deficiencies in the older plants and they should be brought up to a higher standard. This needs to be kept in perspective with where the greater risks are. Simple things like sealing backup diesel engines and burying fuel tanks or using passive safety systems are well known and should be implemented where appropriate. Have less rooftop solar and more solar like Coolearth or integrate the rooftop solar into the roofing tiles so there is less incremental risks to workers falling. Try to shift to kite generated wind that uses less steel and concrete. Using up to ten times more steel and concrete is a source of mining and industrial deaths.